Know someone who might benefit from a little green in their life but don’t want to burden them with responsibilities? Go straight for a terrarium. Here’s a venue where plants can thrive without hassle. 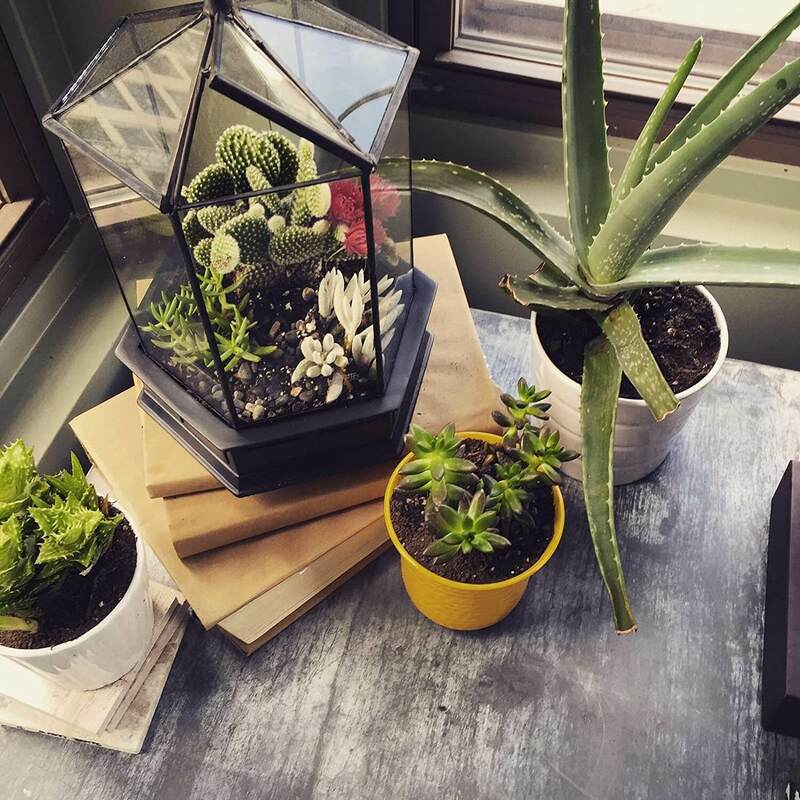 Not only are they trouble-free, but terrariums put a shine on any plant sequestered within. Plus, terrariums take the pains out of growing. Your friend, relative, neighbor, or lover won’t need a sunny exposure. The terrarium will be on auto-pilot and will rarely require water. Basically, flower-related fuss will be a thing of the past. There’s the “from-the-heart” factor. Talk about giving something that’s personal –a terrarium is like a piece of living art. Your instincts and my design tips will combine to make a memorable piece. Gift terrariums come in all shapes and sizes. You could go for a glass cloche and fill it with a small, expressive scene. You might want to present some lucky recipient with the Rolls Royce of terrariums — a Wardian case. Even within the Wardian case realm, you can select from a vast array of sizes and styles. They come in table-top as well as floor-standing versions. Add a free-standing Wardian case to a room, and it commands all the impact of a fine piece of furniture. Fill it with green, and nature sends its positive vibes flowing throughout the scene. 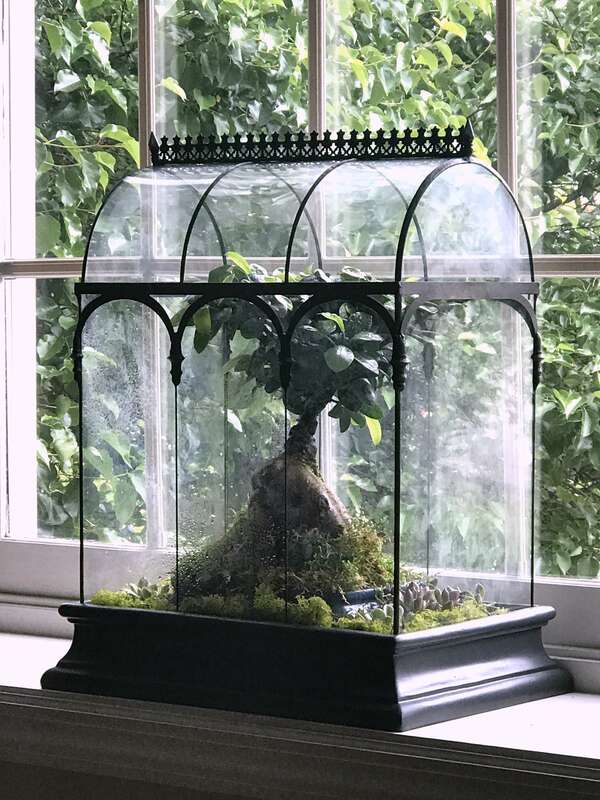 You could design a mini-garden within your glass case complete with down-sized arbors, little trees, and Lilliputian tools, or let the lucky new owner design their own crystal kingdom. If you go the planted route, be sure to include care instructions. Or, better still – include a copy of my book, The New Terrarium. But garden-related themes aren’t the only option – a terrarium can display just about anything from your seashell collection to antique toys. Terrariums are miniature worlds for children!